A dynamic, regional destination with shops, entertainment, and engaging public spaces. Liberty Center, located between Dayton and Cincinnati in Liberty Township, is a premier 64-acre mixed-use town center featuring retail, entertainment, hotel, residential and office uses, around a true community center where people can gather. MKSK collaborated with Torti Gallas + Partners, RTKL and KA Architects to develop a vibrant streetscape and parks system. Liberty Center provides permanent and flexible performance spaces within two dynamic public plazas, The Park and The Square. 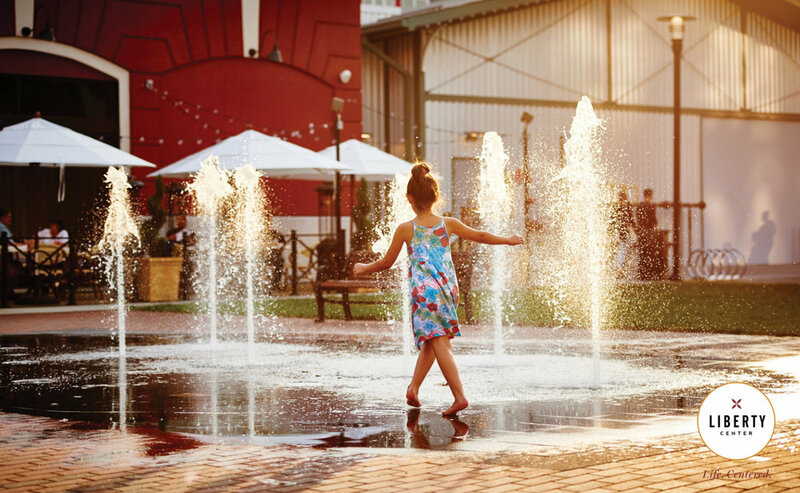 The Park is a formal, family-oriented open space with a custom designed pergola, an interactive fountain and children’s splash pad, train display garden, shaded seating and an event lawn. The Square provides a modern contemporary feel with a prominent, custom paved plaza and larger event lawn for concerts and performances, a dynamic canopy and stage for entertainment, sculptural fountains, and public art elements and is surrounded by outdoor restaurant dining spaces which provide a backdrop for visitors and residents. MKSK, in conjunction with Hoerr-Schaudt Landscape Architects, also documented the landscape design for Liberty Center’s main green roof landscape that connects the two parks over retail structure. The rooftop park includes meadows, water features, and public art pieces that reflect and enhance the character of the rooftop experience and adds to the rich public realm.